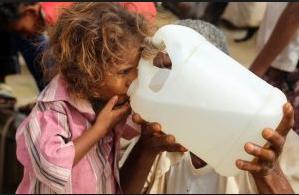 Thousands of civilians are trapped in Yemen’s Hudaydah as Saudi Arabia and allies step up their attacks to capture the port city from the Houthi Ansarullah movement. Backed by air power from Saudi Arabia and the United Arab Emirates, militia groups loyal to Yemen’s ousted former president, Abd Rbbuh Mansour Hadi, have been pushing to seize the Duraihami District, which lies adjacent to southern Hudaydah. The Saudi-led front mounted a new offensive in Duraihami on Tuesday, two days after laying a siege to the heavily-populated area. Local reports said the area is being constantly targeted by Saudi-led airstrikes, rocket attacks, artillery and an ongoing ground offensive. The Houthi fighters say the Saudi-led coalition has been indiscriminately targeting civilians. “The aggressor’s mercenaries are attacking the city randomly and they have destroyed houses and killed civilians inside them,” a Houthi fighter in Hudaydah told Middle East Eye news portal. “The airstrikes killed dozens of civilians in Duraihami and they are still targeting civilians, while Ansarallah [the Houthis] are fighting face-to-face on the ground,” he added. While authorities are trying to cope with a severe shortage of food and medicines due to the Saudi siege, the attacks have also crippled internet coverage across the region, making it almost impossible for residents to contact the outside world. “There are some people that have bled to death [in the street] and no one dared to help them because of the clashes. Some corpses have decayed in the streets,” one resident said when reached by MEE. Human Rights Watch says the Saudi-led coalition has conducted scores of “indiscriminate and disproportionate air strikes” hitting civilian objects that have killed thousands of civilians “in violation of the laws of war”, with munitions that the US, United Kingdom, and others still supply. In one of their most abhorrent attacks, Saudi warplanes targeted a school bus in Yemen’s northwestern province of Sa’ada last week, leaving 40 children and 11 adults dead. According to data from an independent monitoring group, the Yemen Data Project, this was just one of 55 instances of attacks on Yemeni civilian vehicles this year. The group also suggests that Saudis are targeting civilians on purpose as an extensive analysis of over 18,000 airstrikes from March 2015 to April 2016 shows that almost a third (31%) of the targets were non-military – civilians or civilian infrastructure. This is while only 36 percent of the attacks targeted military sites. The rest of the attacks were classified as having an unknown target.